The pop-up shop has become a retail phenomenon, hosted by brands of all types and sizes, and for good reason. They help build name recognition, break out of the e-commerce bubble and into the real world, and help brands test strategies to see what works and what doesn't. This past spring, the New York Times hailed pop-up shops as a new frontier in retail. They enable retailers to innovate and make sales in a time when many major retail chains are struggling. Sound like something you'd like to try? Here's what you need to know. A pop-up shop that lasts only a day nonetheless takes a lot of time and energy to plan. First of all, you need to choose your location. Small Business Trends suggests picking a location near complementary businesses to attract your target customers. Putting your pop-up in the middle of nowhere won't get you far, so be open to working in a small space. How do you find the space? Shopify suggests reaching out to local art galleries and malls, and scouring listings sites like Craigslist. You can even rent a truck if the local laws allow it. TopShelf Boutique did just that back in 2012, managing to get its goods to the streets of San Francisco and scoop up press in the process. As a result, they were featured on SFGate, the San Francisco Chronicle's website—one of the first major news websites. Think of this environment not just as your retail post for a few days, but as a tangible representation of your creative vision. Find ways to be playful and interactive. Also, if possible, get a space that's Wi-Fi enabled, so you can encourage social media sharing among consumers in real time. Pop-up shops are treasured by e-commerce retailers looking to branch out into the brick-and-mortar world. If you've only ever sold online before, this is your chance to experiment with product layout and a hands-on sales team. A great example of an online retailer who successfully uses pop-up shops to bridge online to offline is the custom menswear brand Indochino. Since 2014, the retailer has been popping up in luxury locations all over the place to get men fitted and styled (and, as you can read in Fast Company, they're still at it). Indochino is based in Canada, but thanks to the pop-up shops, it regularly hits up NYC, Philadelphia, San Francisco, and Los Angeles. As Facebook Business reports, they use a combination of Facebook's Custom Audiences and some good, old-fashioned geo-targeting to reach the people in their existing customer base who would most likely stop by the pop-up. Bear in mind that you can get creative in this vein, as well. Take Marc Jacobs's 2014 pop-up locale centered on its then-new fragrance line, Daisy. The brand, which already had plenty of brick-and-mortar locations, let consumers "pay" for products using "social currency," according to Mashable. Trading products for tweets, Instagram pics, and Facebook posts, Marc Jacobs ramped up its social media following. Not a bad trade-off, if you can afford it. A pop-up is special in that, at its heart, it's an ad campaign. You have however many hours or days to bond with followers, create awareness, and ultimately make sales. As with any other ad campaign, you must pay attention to what's a hit and what's a miss. Even a giant retailer with tons of experience may host a pop-up to get a better understanding of what consumers want. For instance, last December, Target unveiled its "Wonderland" pop-up shop in Manhattan, building hype around its holiday products, and surely gathering insights on what elicited the jolliest reactions. 1. 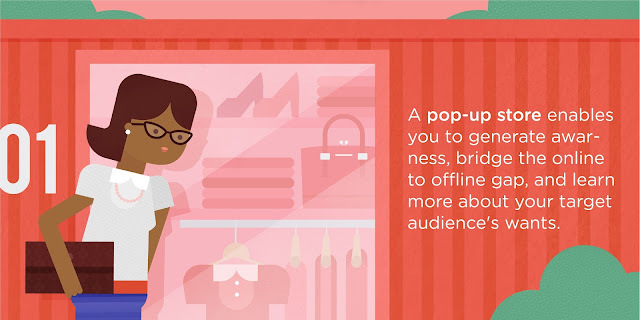 A pop-up shop enables you to generate awareness, bridge the online-to-offline gap, and learn more about your target audience's wants. 2. Any location can be transformed into a pop-up, so long as it's near other businesses and (ideally) Wi-Fi enabled. 3. Whether you're big or small, this is a chance to hype your products and make a campaign you can learn from, so keep track of what customers are flocking toward and why.